Content marketing—for many marketers, their daily routine, for others, a desired long-term sustainable strategy. But is it really sustainable when new trends are emerging every day, and the volume of content produced is increasing? A few months ago, we conducted research among marketers from various industries in order to get better insights on their top priorities and main challenges. Guess what? Producing more content was priority number one for the majority of them. Even though some of them didn’t have their content strategy thought through or in place, or didn’t have any content analytics running to evaluate the performance of existing content. These marketers were driven by visions of higher conversion rates, more leads, and, therefore, more business opportunities. It is stressed so often that a lot of people feel they are late to the party and that they need to produce more and more content—no matter how their current content is performing. But more importantly, marketers are so obsessed with producing more content that they don’t even think about whether the amount of content they produce can even be consumed. 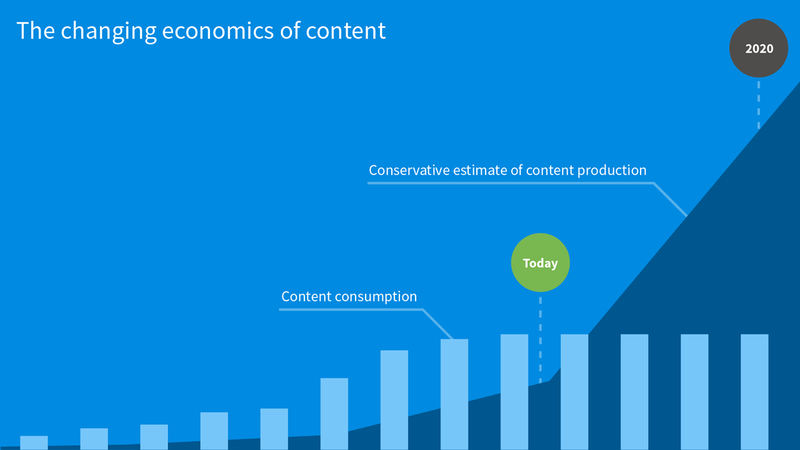 In the picture below, you can see an analysis from Mark Schaefer of how the economics of content are changing—more importantly, you can see that while content production is growing, consumption is simply reaching its limits. He calls this phenomenon “Content shock” and stresses that producing more and more content is not going to work as a sustainable strategy in the long term. We don’t have to go far for an example—just think of the amount of social posts you see per day, how many emails you receive, and how many videos or articles you come across on a daily basis. Now how many of these pieces of content do you simply ignore, skip, or delete right away? And how much time do you spend on the rest? We’re living in an era where we’re preoccupied with content as its production is exponentially exploding, but demand is flat. It’s a competition for attention. Now you might be asking: what does it mean for me as a marketer or marketers generally? First of all, as Mark claims, it means that producing quality content that connects with your experience will be more costly. Secondly, it also means that today, you might still be fine with producing a lot of untargeted content as the consumption limits still have some room. But soon, this won’t be enough, and in a year or two, you’re going to compete for the attention of your customers. And you’re not going to be competing with companies from your industry, but anyone who is producing content for your target audience—regardless of the medium where the content is published. So you might be thinking—that’s simple—I will create better content than my competitors. Unfortunately, this won’t work either for two simple reasons: such content will be extremely expensive, and you’re not the only one who is going to try that. Producing great content is not enough. If everyone does that, your content will be just average. Fortunately, there is no reason to panic. There’s always something you can do to. First of all, focus on your content strategy as it is the most important piece of the whole puzzle. All your decisions should have solid foundations in your strategy. Define whom your audience is, what they’re looking for, and what your business can offer them. Second, set goals for your content and measure it. You can’t improve if you don’t know how your content is performing. Track how your audience is interacting with your content, identify and focus on content that works, eliminate the waste. Finally, stand out from the crowd—personalize your content! And to be specific, I am not talking about web-based personalization only, I am talking about personalization across all devices and channels. Personalization that fits the omnichannel definition, which means you’re going to gather and use data about your visitors not only on a website, but also mobile, chatbots, voice assistants, and more. Just to support this idea—a study by Infosys claims that 96% of retailers say that personalization plays a role in the purchasing decisions of their customers. What is more, 59% of customers believe personalization has a noticeable influence on purchasing. Before you start implementing personalization in your channels, there’s one thing I would like to highlight: good personalization is about delivering memorable experiences for your customers, but that doesn’t mean good personalization has to be difficult and complex. It can be rather simple, but it must meet your customers’ expectations. To show you how simple it can be, I have two examples for you. The first one is a website probably all of you know—Booking.com. A few months ago, I was searching for a hotel in Vienna. 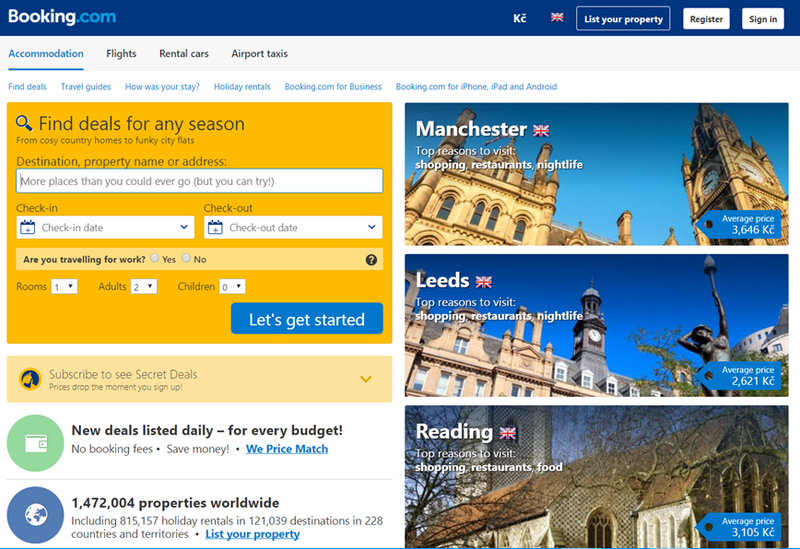 So I entered the Booking.com website, and this was the homepage with the top offers being for UK cities. Nothing special. But then I searched for Vienna and explored some of the hotels in more detail. Unfortunately, as is usually the case, something more important came up, I had to close the browser and leave the computer for a while. 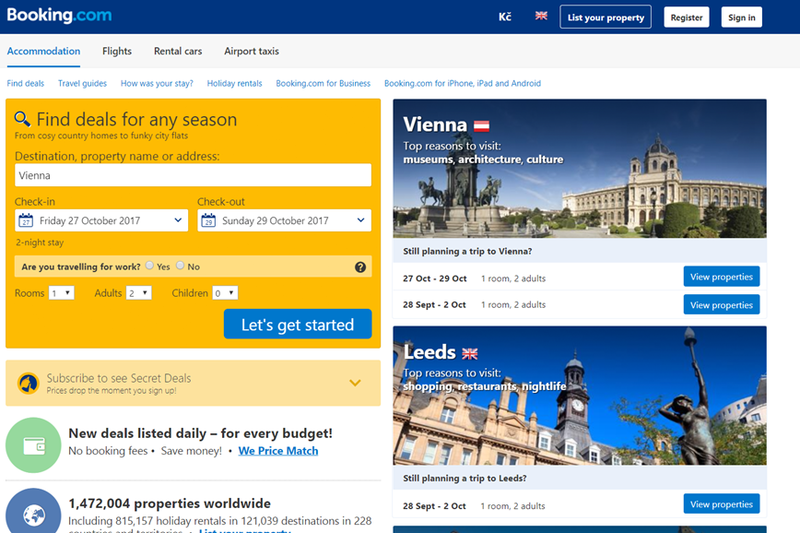 But when I came back and visited the Booking.com again, the homepage was personalized. As you can see, the top offer was Vienna—they even remembered the dates and filters I had used and directly offered me the option to browse available accommodation. Later on, some of the accommodation was even highlighted as special offers. They used my previous browsing history to provide me with a personalized experience, which allowed me to continue my previous journey and purchase very quickly with a smooth experience without filling in all trip information again. Moreover, if you install Booking’s mobile application, everything is well connected, and you get the same tailored experience as on the web. Another example is a coupon site from the Czech Republic—Slevomat.cz. It works similarly to Groupon—you purchase a coupon and then redeem it for various services or products with significant discounts. You can easily purchase anything from accommodation, food, trips, romantic evenings, etc. In the picture below, you can see their homepage that everyone sees when they enter the site. As they don’t know who you are and what your preferences are, or whether you’re looking for something specific, they show you a mixture of their offers. But let’s see how the homepage looks when I log in, and they recognize me as a regular customer. I bet you can easily notice from the picture below what my last two purchases were, right? They leveraged my purchasing and browsing history and personalized the homepage to show first offers for massages and restaurants because it’s more likely that I will purchase them again. But the website is not the only personalized channel, they also have a mobile application that shows you personalized deals, and they even send you a personalized newsletter with highlighted deals from the sections you’ve been exploring. Content marketing can be really powerful, but in the long term, marketers will have to differentiate their content. By leveraging even simple personalization, marketers can target their audience with more relevant content and stand out from the crowd. So, what about you, what’s your experience with content overproduction or personalization? Let us know in the comments!